Fractal Dimension and Elasticity - is there a connection? 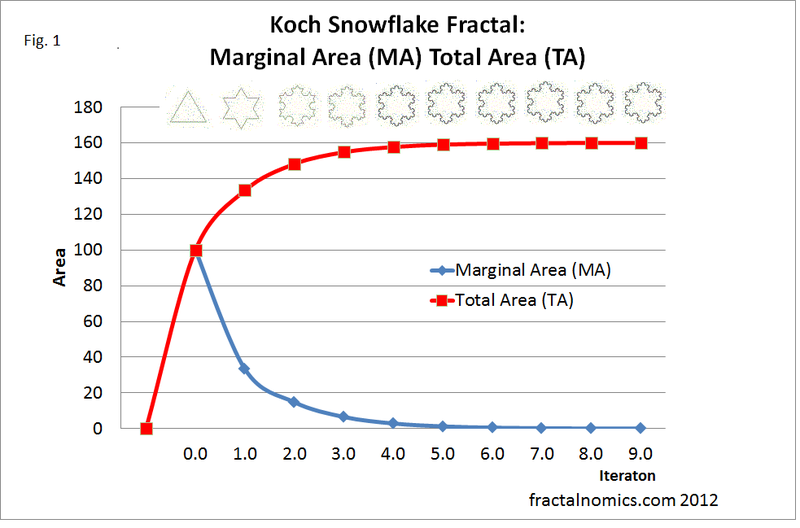 I have found - after analysing the Koch Snowflake fractal with standard economic analysis - that there maybe a connection between Economics 'Elasticity coefficent' (which is a universal measure of the change in one variable to a change in another) - and the fractal dimension. That is to say, Price Elasticity of Demand (PED) is possibly the same as , or at least related to, the fractal dimension (D) - a measure of complexity. This may help explain the logarithmic nature of the demand curve. Below you can also listen to a video blog of me on this topic too. In my last blog I established that the blue (MA) curve in Fig. 1 -showing the change in area in the 'Koch Snowflake' after an other iteration- is mimicking or demonstrating something central to traditional marginal analysis and utility theory: that it maybe the origin of the consumer demand curve as we know it. The next question begs - what's the MA's elasticity? The reason I am so interested in Elasticity and Fractal Dimension is because of the occurrence of the -1.25, percentage change in area - that would traditionally be percentage change in Price. When I first saw this -1.25 it didn't register, then I remembered seeing it before in the book - The Colours of Infinity, Clear Books, pg 17 - where it showed that the fractal dimension of an island is around 1.25 - this is close (very close) to the fractal dimension of the Koch Curve which is 1.2618. It is very close to 1.2618, what does all this mean? that elasticity is the same as, or closely related to, the fractal dimension? And if so, is elasticity a measure of complexity in a system: FD is after all what complexity you would expect to see with another iteration or scale - is this not PED too? That the logarithm knowledge surrounding the method of calculation of PED and that of the demand curve has its origin with fractals and the fractal dimension? The more I look at the world the more I am convinced that there is a connection between Fractal Dimension (FD) = E.
Food, and other primary products - and the countries that produce them are all said to be relatively low in elasticity. Conversely, technological goods - and the countries that produce them are said to be relatively high in elasticity. Ask yourself, are developing countries (primary producers) relatively speaking less complex compared to that of developed countries? Yes. I believe that there is a connection. Frustrated with my results, I recently began thinking about the quantity of triangles to explain growth. It dawned on me that I should be using the number of triangles added at each iteration for the calculation and not the iteration number as above. Fig. 3b below shows the number of triangles added as the Koch Snowflake develops. Tables below this show the calculation of Elasticity of the Koch Snowflake. The mid point non linear formula show a constant elasticity, and is very close to the fractal dimension of the Koch curve. I feel like I am in business. 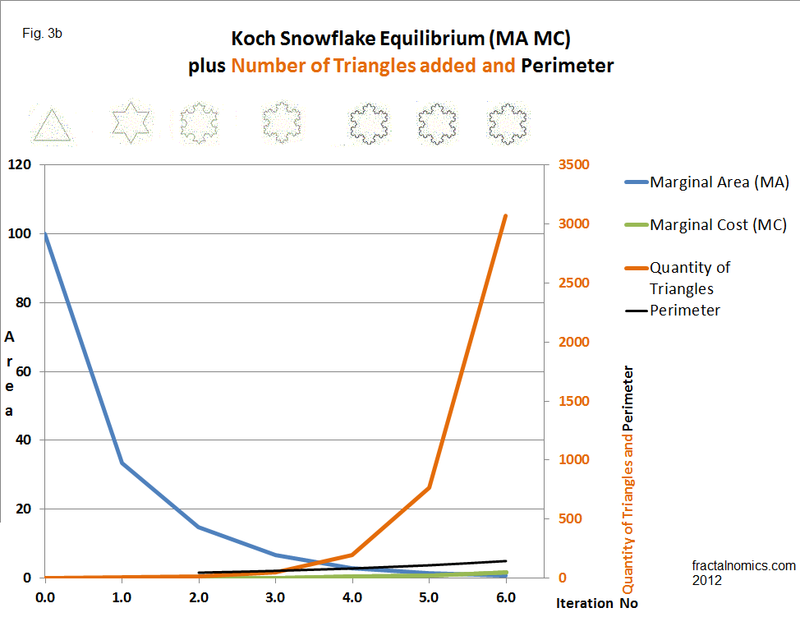 The Fractal Koch Snowflake elasticity fits with the Economic text book theory: it is exponential and thus logarithmic. It fits that economies are fractals. 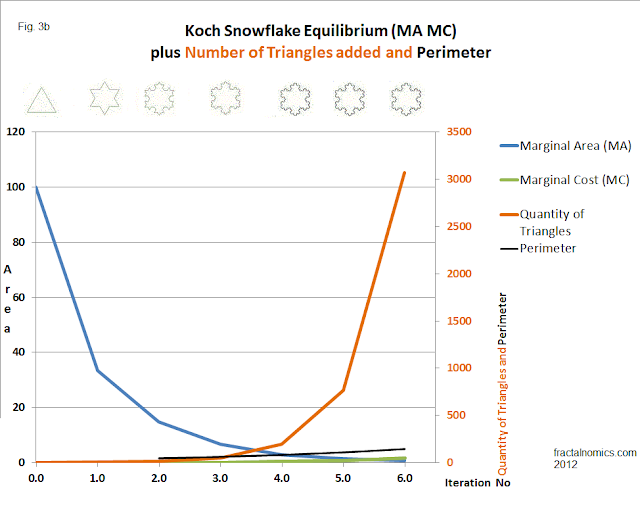 Late last year I produced this entry (log and exponential analysis of koch snowflake). Please take a look if you are interested.